Site servicing – All aspects covered starting from excavation and backfill of the building, to install of water, storm and sanitary services, to final install of concrete curbs and asphalt paving. 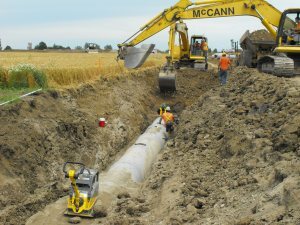 We also pride ourselves in guiding customers through their site and drainage plan process. We work with a trusted engineering team to design a practical and economical plan that will ensure water is diverted to the right location. The design process is just as important as the install process and we always make sure our customers are aware of this. Available Services Pamphlet “There is more to us than just concrete” .